This YCAPS-JUMP-ICAS seminar looked at the challenges China’s rise presents to U.S. Maritime Strategy. The event was held on March 4 in Yokosuka. 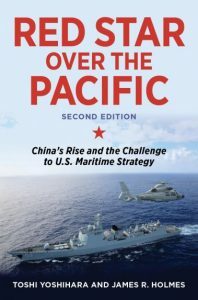 In the second edition of their classic book, Red Star over the Pacific: China’s Rise and the Challenge to US Maritime Strategy, Professors Toshi Yoshihara and James Holmes assess how the rise of Chinese sea power will affect U.S. maritime strategy in Asia. Combining a close knowledge of Asia and an ability to tap Chinese-language sources, the authors argue that China is laying the groundwork for a sustained challenge to American primacy in maritime Asia. To defend this hypothesis, they look back to Alfred Thayer Mahan’s sea-power theories, now popular with the Chinese. The book considers how strategic thought about the sea shapes Beijing’s deliberations and examines the Chinese navy’s operational concepts, tactics, and capabilities. They conclude that China now presents a challenge to America’s strategic position of such magnitude that Washington must compete in earnest. 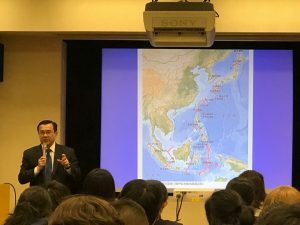 Dr. Yoshihara provided an overview of the book, discussed the implications of Chinese sea power for the U.S.-Japan alliance, and took questions in a dynamic and enlightening seminar. To frame the discussion, Yoshihara referred to Mahan’s three pillars of sea power: commerce, political will, and the military power to protect economic interests. China’s pivot to sea power to achieve national greatness is a substantial pivot from centuries of obsession with potential threats from lands to the west and northwest. Three structural factors—economic, geographic, and political—propel China’s return to the seas via a grand strategy—economic prosperity leading to sea power, and eventual national stature. In addition to military power, Chinese grand strategy employs influence operations to bombard the media and educational institutions with pro-China messages and subtle self-censorship. During the question and answer session, audience members considered potential strategic moves, from deterrence by interdependence, to escalation, and adoption of nuclear weapons by allies, as well as the rhetorical policy backdrop which accompanied the election of President Donald Trump. Professor Yoshihara noted that China’s bristling confidence on the seas and entrée into the ideological realm has prompted U.S. long-term strategic decoupling from sources of power which have enabled China’s rise. The 5:30 p.m.-6:30 p.m. reception featured a light meal, drinks, and excellent conversation. 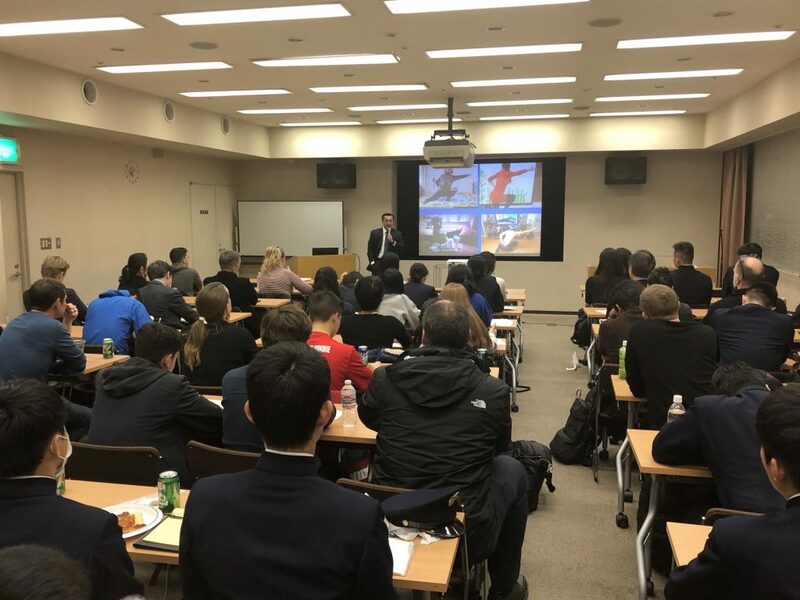 The seminar attracted a record crowd of 65 people from Tokyo, Yokohama, and Yokosuka, representing business professionals, scholars, the Japanese National Defense Academy, and the intelligence and diplomatic communities. This YCAPS-JUMP Seminar took place in Yokosuka Werk in central Yokosuka, which is a short walk to Yokosuka-chuo Station or the U.S. Navy base’s Womble Gate. The event was also co-sponsored by the Institute of Contemporary Asian Studies. Before joining the Center for Strategic and Budgetary Assessments, Toshi Yoshihara held the John A. van Beuren Chair of Asia-Pacific Studies at the U.S. Naval War College where he taught strategy for over a decade. He was also an affiliate member of the China Maritime Studies Institute at the War College. Dr. Yoshihara was a visiting professor of international politics at the Fletcher School of Law and Diplomacy, Tufts University, from 2008 to 2017. He has also taught as a visiting professor at the School of Global Policy and Strategy, University of California, San Diego and as a visiting professor in the Strategy Department at the U.S. Air War College. Dr. Yoshihara has testified before the Defense Policy Board, the House Foreign Affairs Committee, and the U.S.-China Economic and Security Review Commission. He is the recipient of the Navy Meritorious Civilian Service Award in recognition of his scholarship on maritime and strategic affairs at the Naval War College. He is co-author of Red Star over the Pacific: China’s Rise and the Challenge to U.S. Maritime Strategy (Naval Institute Press, 2010), which has been listed on the Chief of Naval Operation’s Professional Reading Program since 2012. Translations of Red Star over the Pacific have been published in China, Germany, Japan, South Korea, and Taiwan. He has also co-authored Indian Naval Strategy in the Twenty-first Century (Routledge, 2009) and Chinese Naval Strategy in the Twenty-first Century: The Turn to Mahan (Routledge, 2008). He is co-editor of Strategy in the Second Nuclear Age: Power, Ambition, and the Ultimate Weapon (Georgetown University Press, 2012) and Asia Looks Seaward: Power and Maritime Strategy (Praeger, 2008). His articles on Chinese seapower, maritime strategy, and Asian security issues have appeared in Journal of Strategic Studies, Asian Security, Washington Quarterly, Orbis, World Affairs, Comparative Strategy, Strategic Analysis, Journal of the Indian Ocean Region, and Naval War College Review. The Naval War College Review awarded him the Hugh G. Nott Prize for best article of 2010.